(NEW YORK) — There will be no rest for serious Black Friday shoppers. Walmart kicks off the holiday shopping season on Thanksgiving when its doors open at 6 p.m. Some of the standout deals advertised include $27 for popular games, including FIFA 16 and Madden 16, along with kids bikes starting as low as $39. The retailer is urging shoppers to plan ahead by downloading the a store map on Walmart.com or through the Walmart app. Doors open 6 p.m. Thursday at Target. Among the doorbusters luring shoppers to the retailer are 25 percent off all Apple TV boxes and a $100 gift card with the purchase of an Apple Watch. Parrot Drones, one of the hottest holiday items, are being offered for $69.99 (a $30 savings) while supplies last. Doors open Thursday at 7 p.m. with the first 100 shoppers receiving a free mystery goody bag. Doorbusters include Star Wars figurines for $9.99 ( a 50 percent savings), select kids denim for $6 and 50 percent off all holiday string lights. 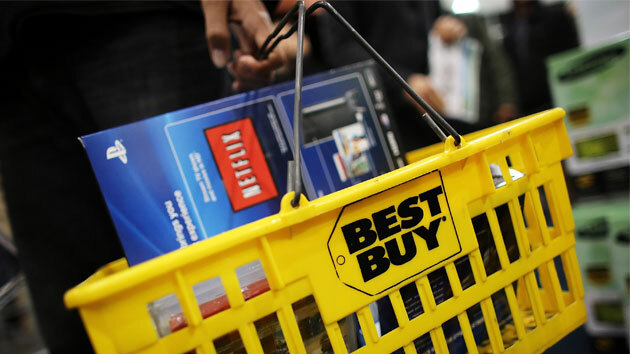 Best Buy opens at 5 p.m. on Thanksgiving. Doors close Friday at 1 a.m. and stores re-open Friday at 8 a.m. Among the doorbusters are a 4K 60-inch Samsung TV for $799.99 (regular price $1,4999.99). A Toshiba 49-inch HDTV is being offering for $149.99 (regular price $429.99). Staples is closed on Thanksgiving but will open on Black Friday at 6 a.m. Some of the top deals being offered include a Toshiba i3 notebook with Windows 10 for $299 (regular price $499). Some drones regularly priced between $39.99 and $99.99 are being sold at a 15 percent discount. Opening at 9 a.m. Friday, Costco is offering $40 off a Kitchen Aid 4.5 quart Tilt-head Stand Mixer and $50 off an Xbox One console. Don’t forget to pick up the AA batteries for all of those holiday toy purchases. Costco is offering a 30 pack of Duracell Quantum AA batteries for $5 off. Sam’s Club opens its doors at 7 a.m. on Friday. The Walmart-owned retailer is planning some big deals including $150 off the iPad Air 2 and a 14-piece stainless steal cookware set by KitchenAid for $109.98 (a $50 savings). Sears opens at 6 p.m on Thursday and is offering family athletic shoes for buy one, get one free. Early bird shoppers will also enjoy a 30 percent off coupon found in the Sears circular that can be used on clothing purchases of $50 or more. After its famous New York City parade has wrapped up, Macy’s will open its doors at 6 p.m. on Thanksgiving Day, kicking off the holiday season with some insane door busters, including 60 percent off Samsonite luggage and 30 percent off all diamond engagement rings. Kohl’s kicks off the savings at 6 p.m. on Thanksgiving. Doorbusters include 50 percent off toys from top brands including Fisher-Price, Payskool, Barbie and Hot Wheels. Kohl’s is also offering $15 Kohl’s cash for every $50 spent until Nov. 29. The certificates will be redeemable between Nov. 30 and Dec. 6. Doors open at most JCPenney stores on Thursday at 3 p.m. Deals include a 13-piece cookware set for $29.99 (after a $20 mail-in rebate) and various kitchen appliances for $9.99 (after a $10 mail-in rebate) including blenders, toasters, waffle irons and hand mixers. Home Depot opens at 6 a.m. on Black Friday and promises shoppers up to 40 percent off some major appliances. Stores open at 5 p.m. on Thanksgiving. Mini 12-volt Cadillac Escalades are being offered for $299.99 (a $150 savings) while LEGO Ultra Agents construction sets are being offered at a doorbusting discount of 30 percent.